“My artwork is personal. 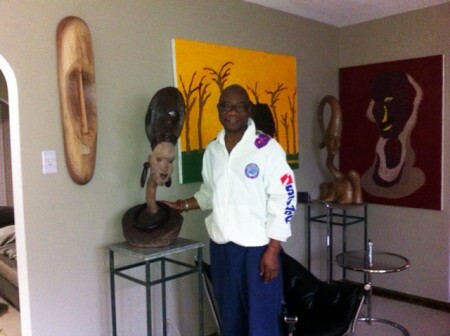 It is food for your soul,” said Felix O. Eboigbe, a local sculptor still showing his artwork nationally at age 70. Originally from Nigeria in West Africa, Eboigbe grew up in the small town of Aba where he attended a Catholic private school, Princess Day School. At age seven, he knew he wanted to be an artist, but his father, a Benin chief (or mayor) of Aba discouraged him. His dad wanted him to be a physician. Eboigbe persevered. At 12, he saw a sculpture in a book and in front of a federal building. He was sold. “I saw what I liked to do,” he said. But, he knew his parents would not be in favor of a career in art. Even though his primary and middle school did not offer art, Eboigbe knew he wanted to do something with his hands. Waking him up at 3:00 a.m., his mother told him she didn’t have the money to send him to art school. But, an understanding uncle supported his apprenticeship at age 17 for three years with Ben Aye, a famous Nigerian sculptor. Usually, an apprenticeship lasts five years, but Eboigbe was talented enough to complete his studies earlier. In addition, he studied art at Lagos University, but did not receive a degree. Struggling to find a gallery, Eboigbe eventually found an art studio in Lagos in 1967 where he met a lot of ambassadors who stopped in from nearby embassies. The Nigerian Daily Times did a review, and he was discovered. Through the efforts of the Ford Foundation, the United States Information Agency and the American Embassy, Eboigbe was invited to come to America as a teacher and resident sculptor, according to his biography. Although offered several posts, Eboigbe selected Indiana University in Bloomington, Indiana where where he served as an artist-in-residence and teacher for twelve years. He was sponsored by Indiana University Foundation and the Department of Afro-American Affairs. His preferred medium is wood. “It is alive, almost a piece of sculpture already,” he said. Primarily, he works from imagery in his mind. Henry Moore, a British sculptor known internationally for semi-abstract monumental sculptures, influenced his art. When he saw Picasso’s work, he said, “I could do that.” He also likes indigenous art found in African masks. His teacher Ben Aye showed him how to do abstract work. Eboigbe, whose name means ‘happy and innocent,’ sculpts in two styles, abstract and realistic. Some of his pieces are large, standing 7 to 9 feet tall and weighing up to 450 pounds. Tools he uses are handmade ebony mallets, chisels and an axe. In the abstract, he creates mainly female figures or animals. Realistic figures are often warriors, chiefs and women. 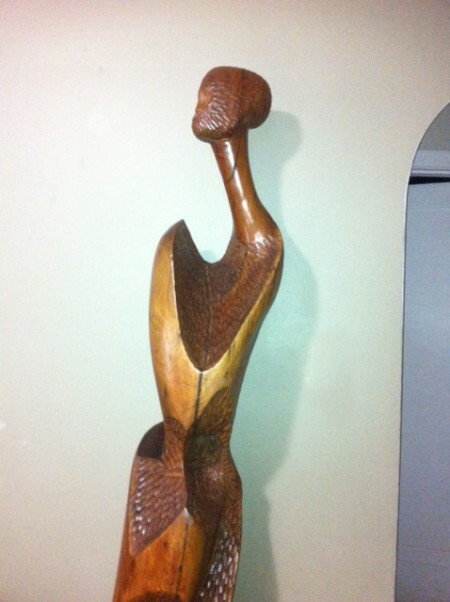 Eboigbe recalls stories his grandfather told him and often translates them into sculpture. After Indiana, he moved to Cincinnati in 1983 and continued to sculpt and show his art. At an art opening at The Westin Hotel, he met Cincinnati politician William Mallory, Sr., who purchased a sculpture to surprise his wife and then took the artist to the Blue Wisp and the Celestial Restaurant. Looking out the window from the Mt. Adams’ restaurant, Eboigbe thought the hilly city reminded him of San Francisco. “I like it here,” said Eboigbe. Through the support of the office of then Governor Richard Celeste, Eboigbe landed a studio at the University of Cincinnati’s Tangeman University Center. Subsequently, he had studios in a house owned by the university on Lafayette Ave., on Short Vine, in the Emery Building and eventually his house. Now living and working on Grovedale Ave. in Hyde Park, Eboigbe continues to create and present. He feels he is better known outside Cincinnati, however. A visitor enters his living room in Hyde Park. Immediately, one can see examples of his sculpture. He has filled his rooms with works of art. 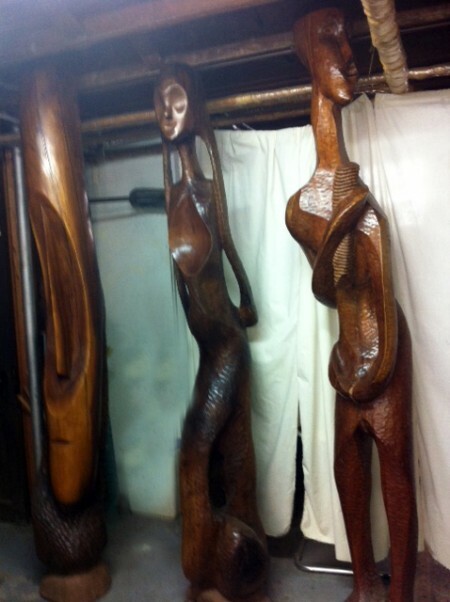 Downstairs, he has his studio with several sculptures standing upright. One is struck by imposing figures fashioned out of wood. Primarily retired, Eboigbe shows his art occasionally out of his house. Two of his children, Grace and John have followed in the creative field. Grace is an actress in Hollywood and John is a cartoonist in Cincinnati. Maria is finding her way in Michigan. He followed his own advice and found a niche.